Geography sits comfortably between the sciences and humanities. It is the study of the physical and human environments and the inter-relationship between the two. At Mill Hill, we aim to foster a wonderment about the world around us which will hopefully last a lifetime. The skills developed as part of the courses will equip our pupils for the future through: fieldtrips; independent and group projects, where team work and collaboration are key; public speaking and presentations. They will have a chance to debate the main issues facing the world, including climate change, inter-dependence between countries and issues regarding resource management. They will be taught to be free thinkers who are able to formulate their own ideas using a variety of data sources. Overall, we want our Geographers to enjoy the world around us. Beyond the classroom, there are a variety of ways in which the pupils can enrich their understanding. The popular ‘GeogSoc’ allows us to visit topics that are not necessarily on the exam syllabi. Membership of the Royal Geographical Society allows pupils to attend lectures in Central London as well as accessing alternative resources. 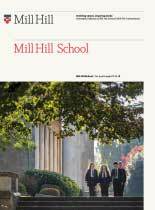 Pupils are also encouraged to submit their own articles to the School magazine – ‘The Millhillian’. Various periodicals, including The Geography Review and Wide World are made available to all pupils to encourage reading beyond the prescribed textbook. An important aspect of Geography is fieldwork. It is widely known that pupils learn best through seeing and doing, therefore the department takes various trips including UK residential trips to Yorkshire and a biannual overseas trip to countries such as Iceland.